Contaminated seafood from China is flooding the United States, are you safe? Do you really know what is going to be on your plate when you purchase seafood? There’s a good chance you don’t — and maybe you don’t want to know. Seafood laced with antibiotics is flooding the marketplace here in the U.S., and if that isn’t disturbing enough, most of this seafood is coming from China — where it was most likely raised on pig feces. Upwards of 80 percent of the seafood in the U.S. is imported, and a good portion of that is of Chinese origin. In 2016, it was estimated that nearly 30 percent of the seafood Americans eat actually comes from China. In 2014, $2.9 billion worth of seafood was imported from the nation, making it the third largest importer to the States. As Bloomberg describes, livestock pens are scattered among the Chinese fisheries. To feed the fish, they simply wash the feces down a pipe that empties out into a pond, and the fish are taken care of. Would you knowingly eat fish that had spent its life in a pond of excrement? Probably not. But, this method of “recycling” has been used in Chinese agriculture for thousands of years. What fattens the pigs also fattens up the fish. Beyond the sanitary concerns of such a process, the introduction of antibiotics to animal feed has served to create an even bigger threat to public health. Upwards of 90 percent of the antibiotics shovel-fed to pigs pass through their digestive systems intact and without degradation. This means that the antibiotics passed through their urine and feces are often still active when they hit the water. And as their waste flows into the ponds for fish food, the little fishes are all being exposed to nearly the same amount of antibiotics that are being fed to the livestock — and that’s on top of the antibiotics that are purposefully put into the water to prevent and treat aquatic diseases. The low standards and lax regulations in China have resulted in seafood riddled with detestable substances and essentially soaked in antibiotics. Isn’t that appetizing? In 2016, a study by the FDA found that 25 percent of the fish and seafood coming from China had traces of chemicals that were forbidden from being used in seafood in the United States — some of which were unapproved drugs and hazardous food additives. Some of the substances found included nitrofurans (a group of antibiotics), green malachite (an antibacterial compound) and Genetian violet (an antiseptic dye). All of these substances are prohibited from being used in seafood and are considered to be carcinogenic. A study of Chinese seafood from the years 2006 to 2011 also concluded that 43 percent of the samples contained multidrug-resistant strains of bacteria. 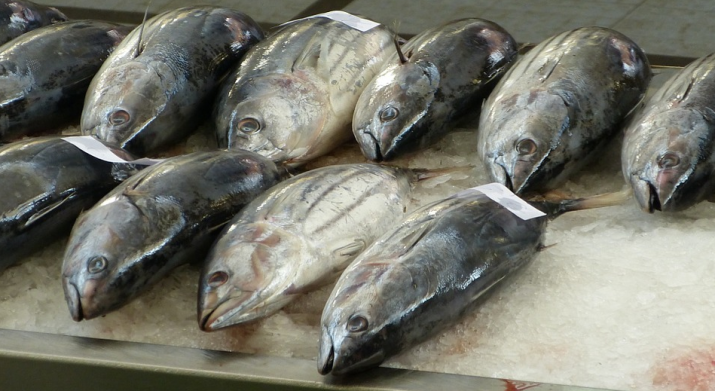 Even wild-caught Chinese fish is often no safer than the factory-farmed varieties. As Natural Health365 explains, many of China’s major fishing areas are deeply contaminated with industrial waste, chemical fertilizers, and heavy metals. Fortunately, it is entirely possible to protect yourself from toxic seafood. It is essential that you carefully read all product labels to determine the country of origin. Terms like “prepared in,” “packed in,” or “imported by” should all be seen as little red flags, as they often indicate that the fish were raised and processed in two different locations. Because farming of fish is not allowed in the state of Alaska, and because the state charter forbids river pollution, wild Alaskan salmon is one of the best options for seafood. Choosing fresh fish over frozen, and smaller fish in general, are also good ways to ensure you are not purchasing toxin-laden seafood.